Millennials: All We Are Saying Is Give Socialism a Chance. A strange alliance between 70-something Democratic leaders and millennial voters is emerging. 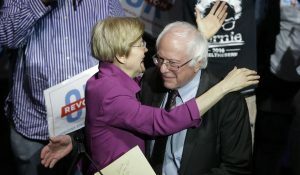 Many of the top candidates for the Democratic Party presidential nomination in 2020, including Bernie Sanders (actually a Socialist Party member running as a Democrat) and Elizabeth Warren, are openly espousing socialist policies including guaranteed basic income, government-guaranteed jobs, forgiveness of student loan debt and other budget-busting initiatives. Even younger Democratic hopefuls, including Sen. Cory Booker of New Jersey, are jumping on the socialist bandwagon. Their ideas are getting a warm reception from younger voters, the millennials (born between 1982 and 2000), who have the most to gain from these policies. Many millennials have had trouble entering the workforce or forming their own households because of the lack of high-paying jobs and the burden of student loan debt. Bernie Sanders-type policies have a lot of appeal to people stuck in gig jobs with Uber and Starbucks. This article explores the alliance of young and old under the banner of socialism. These ideas are not as far out on the fringe as most Americans imagine. In fact, recent polls have shown majority support for government-guaranteed jobs and close to majority support for guaranteed basic income, free money from the government with no work requirement. These formerly fringe issues are now going mainstream. The result will be enormous increases in the national debt and eventually inflation as the only way to deal with the debt. Investors need to prepare now with increased allocations to hard assets such as land, gold, silver and fine art.